Its time to open the review thread. So post your review and comments in this thread. 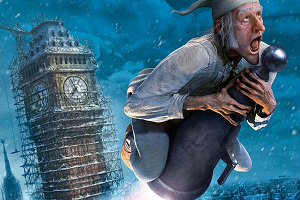 Over the years, Charles Dickens’ A Christmas Carol has been adapted for the big screen countless times with everyone from Scrooge McDuck (1983’s Mickey’s Christmas Carol) to Michael Caine (1992’s The Muppet Christmas Carol) playing the role of Ebenezer Scrooge. Most recently, New Line Cinema’s "Ghosts of Girlfriends Past" took the classic holiday tale to the silver screen, albeit with a few changes (the romantic comedy starring Matthew McConaughey centered on Valentine's Day instead of Christmas). "Disney's A Christmas Carol," the latest big screen retelling, stays much more faithful to the original work than some of its predecessors, which is a bit surprising considering the star of the film: Jim Carrey. Those walking into Robert Zemeckis’ 3-D animated adventure expecting the zany, rubber-faced comic they’ve grown to love over the years will be sorely disappointed, as "A Christmas Carol" stays pretty true to Dickens’ beloved story. There are no moments of improv and no script rewrites to let Carrey’s comedic style shine, which is fine, but with a story told as many times as this one, even at a quick 96 minutes, "A Christmas Carol" feels a little long since viewers have heard it all before. In "A Christmas Carol", Carrey plays seven roles, including Scrooge and the Ghosts of Christmas Past, Christmas Present and Christmas Yet to Come--although that last credit is a bit of a stretch, as the Ghost of Christmas Yet to Come is merely a shadowy, death-like figure with a creepy pointing finger. Really, crediting anyone with the part is a joke. Also playing multiple roles in the movie is Gary Oldman (Bob Cratchit, Marley’s Ghost and Tiny Tim), Bob Hoskins (Mr. Fezziwig and Old Joe) and Robin Wright Penn (Belle, Fan), amongst many other supporting players. Really, the only big star who voices just one role is Colin Firth as Fred. While hearing the actors voice an assortment of roles, though, may sound like fun, to differentiate the characters a bit, each actor used a different accent or played with their own accent to create the various voices heard in the film. For some reason, this results in dialogue that’s a bit hard to understand at times, making the story--as familiar as it is--difficult to follow during certain scenes. Lines go by and viewers haven’t a clue what was said, making parts of "A Christmas Carol" very frustrating to watch. Luckily, the 3-D effects keep audiences entertained throughout most of the film. Unlike some recent big screen 3-D offerings, the effects used in "A Christmas Carol" are pretty amazing to watch, and when the snowflakes begin to fall, you’ll have to stop yourself from reaching out and trying to grab one. While the commercials for the film exaggerate the 3-D effects a bit, making it seem like Carrey will come out of the screen and fly over your head, the effects are still well done nevertheless. If only you could enjoy them without wearing those annoying glasses! While adults and kids alike will be entertained by Carol’s 3-D effects, the movie may not be suitable for young viewers. Sure, it has a PG rating and is a Disney film, but parents shouldn’t take the MPAA’s reason for giving the movie a PG rating lightly. The film is rated PG for “scary sequences and images,” and younger viewers may be a bit terrified by the events that unfold during the Ghost of Christmas Yet to Come’s visit. The sequence that plays out, though animated, is pretty intense, and even adults will be surprised by how scary it is. Parents with young children may want to sit through "A Christmas Carol" by themselves first to judge whether or not their kids can handle it. Overall, "A Christmas Carol" is a faithful retelling of Charles Dickens’ beloved novella, complete with some amazing 3-D effects that really bring the story to life…but one has to wonder if another adaptation was really needed. Without offering anything new to the classic story, "Disney's A Christmas Carol" just feels tired and dull at times, even with Carrey front and center. At least "Ghosts of Girlfriends Past" brought something new to the table. Whether or not "A Christmas Carol" brings in Grinch-sized earnings remains to be seen, but one thing is for certain: as far as Jim Carrey holiday classics go, just like Dr. Seuss said, it looks like the Grinch stole Christmas after all. The 3D effects made the film, not Jim Carrey. Sorry. I did however enjoy the Ghost of Christmas Yet to Come's presence. I nearly jumped out of my skin when the horse head came out of the screen. But yes, crediting Jim with that is kind of a joke, but I enjoyed the break from his voice. 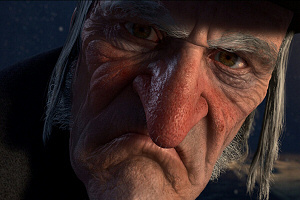 Never thought I'd say that but I hated the voice Jim gave old Scrooge. Jim's voice just didn't fit the old and ornery Scrooge, the one who spoke in most of the movie. sorry. I was bored. That's just my opinion. I give it two stars out of four. Remember to post what you think about it here. I got a review of my own since I'm currently working freelance at a local Maine newspaper, and it's a more positive review! You can think of it as a rebuttal to the official JCO review! The story of “A Christmas Carol” by Charles Dickens has become one of the most well known and remembered stories of all time since it was first published in 1843. The longevity of the story was due to the large number of adaptations for both movies and TV which has happened over the decades since. 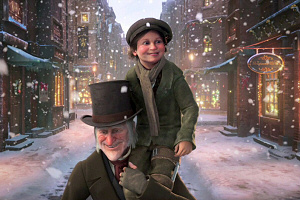 This holiday season, the story has been brought to life once again this time by Academy award-winning director Robert Zemeckis and his team at ImageMovers Digital, and starring Jim Carrey in an unforgettable performance in Disney’s A Christmas Carol. Of course, this story is well known to many around the world, but I’ll try to explain it in a nutshell. In 1840s London, the old miser Ebenezer Scrooge (played by Jim Carrey) is his usual self, counting money at his small banking loft while scowling at his poor co-worker Bob Cratchit (played by Gary Oldman). On Christmas Eve, he’s visited by the ghost of his old partner Jacob Marley (also played by Oldman), who warns Scrooge of an impending fate if he doesn’t change his old ways. He’s then visited by the ghosts of Christmas Past, Present, and Future (also played by Carrey), who shows Scrooge the error of his ways that he must change before it’s too late. This is Zemeckis’ third film after The Polar Express and Beowulf, where he utilizes CG performance capture animation to create worlds and characters that add a touch of realism to a fantasy world. I believe that this film finally achieved what Zemeckis desired in his animation process by transporting the audience into the story and understand the characters enough to sympathize emotionally. Flying around the environments became the perfect way to experience the realistic environments of 1840s London like we are actually there while watching it on screen. It’s also worth noting that this film is also shown in Disney Digital 3D and IMAX 3D (for which I chose the latter), which enhances the experience like a thrill ride worth taking again and again. I’m sure that this story can stay as fresh as when it was first published, not only the animation were to be a big plus but the cast does help too by bringing the characters to life. As a great admirer of Jim Carrey’s film career, the role of Scrooge and the three ghosts is perfect for his versatile talents as an actor. He’s not only one of the funniest actors in Hollywood, but he does surprise everyone with his dramatic acting as well like in The Truman Show and Eternal Sunshine of the Spotless Mind. As Scrooge, he is amazingly brilliant when he mixes the rhythm of his English accent with his unusual physical posture that helps create the character. As the ghosts, he’s also great when he gives each of them a different voice and physical movement that make them stand out from the other adaptations. Not only did Carrey gave one of his best performances, but also a much better performance in a family film than The Grinch and as Count Olaf in Lemony Snicket. I believe his performance is so magnificent; it might come close to being an Oscar-caliber performance. The rest of the cast also did a great job with Gary Oldman also doing great in multiple roles. You can feel the different emotions his Cratchit character goes through, while as Marley, he brings a very creepy presence to his character. One of my favorites is Bob Hoskins (from Zemeckis’ Who Framed Roger Rabbit) as Fezziwig, who brings a jolly presence to one of his scenes. As I mention before, the animation is top-notch and there are even some extended takes that demonstrates the animation’s unique realism. There’s one take I’m sure you’ll notice. It lasts about 10 minutes, and it shows Scrooge’s past from his first flight to his break-up scene with Belle (played by Robin Wright Penn). It definitely shows what Zemeckis can accomplish as a filmmaker. To conclude this review, I pose this question, is it safe for kids to watch with their parents? While it’s definitely fun for everyone to watch despite its PG rating, there are some scenes that are exceptionally scary for some younger tots. For example, there are a couple of moments involving Marley’s ghost and the appearance of the ghost of Christmas future may provoke nightmares. When I was young, that movie would’ve scared me so much, it might’ve changed my perception on Christmas. It reminds me of when Zemeckis directed Who Framed Roger Rabbit in 1988. While a classic family film, it was known for its intense moments involving the character of Judge Doom (played by Christopher Lloyd). But if you can get past some of those scary moments, Disney’s A Christmas Carol can become a holiday staple for future generations to admire. This is sure to be a big hit for families, and fans of Carrey and Zemeckis alike. I saw it on IMAX and in 3D and have this to say: Jim Carrey does well, the effects do well... but this a story I have heard many times before - so nothing new there. I knew what the outcome would be. Now, let's say I had never seen a version of Christmas Carol or never read the book... well, I don't think the characters were well developed for this version in that case. I think Bob Cratchet's family could have been more developed... did viewers really find themselves caring much about Tiny Tim in this version? I saw the movie yesterday. It was awesome! Really luved it!! Lucas Allen dont you go on twitter? is this your icon? I FINALLY SAW IT!!!!!!!!!! !............i couldn't wait until Dec and it was worth it! I loved this movie! I can not lie I will cry at some parts. but overall it was a wonderful movie. and now I can not wait for Christmas! People who think this movie was terrible need to read the real book by Charles Dickens. History has been designed for adults, and it is a ghost story and images are quit alive..
Last edited by astarothstein on Fri Jul 30, 2010 6:32 am, edited 1 time in total.